At the end of every year, the major dictionaries like to publish their words of the year. In 2016, the Oxford English Dictionary went with Post Truth, an apt term if ever there was one. Well, a mere two months into 2017, and it is already looking like there are two hot contenders for their words of the year. I predict it's either going to be "Fake News" or the wonderfully weaselly words, "Alternative Facts". Not that either of these two things are new phenomena. No, we have just called them what they are in the past: lies, nonsense and - well - plenty more colourful terms mainly linked to bovine excrement. Alternative facts and fake news are worrying, because they are used to sway public opinion about a whole myriad of topics but especially about science. You merely need to take a quick look at your Facebook or Twitter feed and there it is, fake news. If it was easy to spot, then no one would be tricked into spreading it. It just wouldn't exist. In fact, it can be so difficult to spot that even the major news outlets are guilty of publishing stories containing fake news, and the most brazen new outlets? Well, they will happily post alternative facts. In this blog, I want to post some simple steps that will get you thinking like a scientist. Then you can spot the majority of fake news, so it no longer influences your opinion. Step 1: Everything is wrong. Assume nothing you read is actually true. Yes, yes, I know this sounds utterly ridiculous, and on the whole such a negative outlook is a pretty crummy way to see things. But just trust me on this. In science, we don't assume anything is true or correct because we read it. Everything needs to be verified. Normally through peer-review. This is basically the process of checking a scientists work, ensuring that the methodology they have used is satisfactory, that they have drawn conclusions that are consistent with their findings and that their work is repeatable. Even then, we can't be certain that they are correct, merely that we do not have any evidence to suggest that they are not correct. Apply this to everything you read: Assume it's not correct, and that there is evidence out there to show that - indeed - it is a bit of fake news. Step 2: Where did you see this? Check where your information is coming from. Is it coming directly from a scientific journal? A dedicated science website? A national news organisation? Or maybe from somewhere less reputable? Fake News? Is this a reputable source? What do you think? After all the world is supposed to be warming isn't it? The more authoritative the source is, the more likely that the story you are reading is based in reality. That is not to say that Scientific journals will always be correct or that Facebook click bait links will always be wrong. Merely that your chances are always better with more reputable sources. But remember, the very first information published about the links between the Measels, Mumps and Rubella vaccine was posted to "The Lancet," a highly respected medical journal (long before anyone had even thought of the term fake news). The media took this to be a good source, ran with the story and panic ensued. It's also very important to check for biases - we all have them; they are unavoidable. But if you are reading a story about how smoking cigarettes really isn't that bad for you, and you happen to be on www.smokingisgreat.com (a made up URL... oh, I do hope it's a made up URL) you should probably be asking if they have an agenda that they want to be serving other than presenting facts. Step 3: Google is your friend. So, you have checked your source; it seems reasonable. Now is the time to double check. Search some of the key terms from whatever it was that you were reading into Google or whichever search engine you prefer. Take a look at the results you get back. A red flag should be being raised in your head at this point. It's pretty much a bang on certainty that what you are looking at is fake news. Our Google search brings up lots of results, but the ones from NASA (a most reputable source) show that the world is not cooling at all. Of course, as always, it's not quite so cut and dry. If there are no other results, maybe you are reading a story that is so new that only one journalist has broken it so far? If it's authentic news, other media should catch up soon enough. If whatever you are reading sounds too good to be true, it probably is. If the author uses emotive language to make you angry or shed tears of happiness, they are probably trying to mask something. Any suggestion of a "conspiracy" should set alarm bells ringing. The use of complicated terminology - with no explanation of what it means - is probably there to confuse you (although very specialist sources will use complex terminology, too, they just expect the reader to already have acquired that knowledge). Are there citations? If so, where do they take you? To reputable or questionable sources? One of our goals at Make Science Easy is to ensure that everyone has a sufficient level of scientific literacy to navigate the world we live in today. 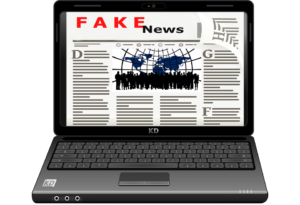 If you find yourself struggling to tell fake news and alternative facts from what is real, then you would benefit from one of our online courses. Sign up now to get information about discounts on membership as well as a Free e-book about 7 scientists who changed the world. Do you have any other tips about how to avoid fake news? If so, share them in the comments below. And if you have a friend who is constantly posting fake news and alternative facts on their social media, then share this page to their wall. Let them see the errors of their ways.